This Memorial Day weekend my family visited Shenandoah National Park. Shenandoah National Park is over 200,000 acres of protected land not too far away from Washington, DC. My family and I left shortly after the kids got home from school on friday and drove 2 1/2 hours to Lynchburg, VA to spend the night. 1. Drive the 101 mile Skyline Drive route from the southernmost point of Shenandoah National Park to the northernmost point at Front Royal. 2. 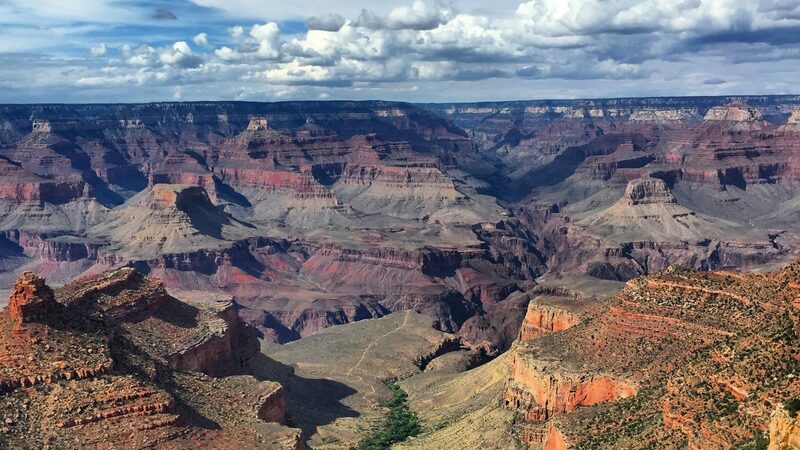 Go on a couple of hikes to truly experience the natural beauty of the park. The South River Falls trail is located at mile marker 62.7 of Skyline Drive. It took us about 30 minutes to get there from the South Entrance at Rockfish Gap. There are 3 parking lots surrounding a small structure of bathrooms and a grassy hill. When we pulled up the bottom lot closest to the trailhead was already filled up so we looped around and grabbed a spot in the second parking lot. There are really 2 different hikes you can do from this trailhead. We opted to do Hike #1 for time and effort as we were planning to do 2 additional hikes later in the day. Our family is in fairly decent shape and a 2.6 mile hike seemed right up our alley—especially with the promise of a waterfall view. We have taken similar hikes at Great Smoky Mountains National Park and Yosemite National Park before so we were excited! The majority of the hike was like the video above. A moderately wide path cut through lush green vegetation, tall trees, and big rocks. The trail had a number of exposed tree roots and jagged rocks so it was necessary to keep your eyes on the ground. Each trail we hiked in Shenandoah National Park had these cool trail signs. I love the textures and the sophisticated look of the embossed metal. About half way down the mountain you reach the South River. There are various jet outs that give you access right up against the water. The rocks created a very soothing sound of water as it meandered down the hill. I loved capturing gorgeous details like this one of the bright green moss on rocks and the sound of rushing water. This was definitely my happy place: a gorgeous hike with my family and my camera in hand! Here’s where our family encountered something unexpected. After taking our time and hiking for about 45 minutes down the mountain, we finally ended up at the South River Falls Observation point, 1.5 miles down. As you can see, with the lush growth in the treeline, we could barely make out the actual South River Falls! I imagine this is way more beautiful at the end of winter or the tail end of the fall. For now, we could only catch a small glimpse and the sounds of the rushing waterfall. In multiple areas of the trail where trees have fallen in the trailpath, there have been clean cut chunks of the tree trunk taken out. My wife had the idea to take pictures between them and it immediately became my favorite picture of the day! After a disappointing view of the falls, it was time to head back to our car. 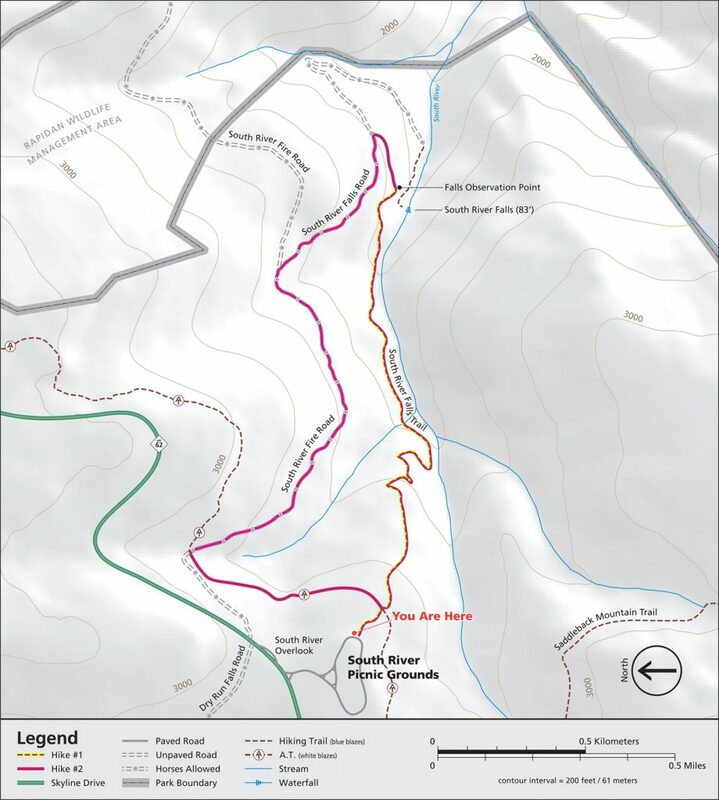 Here is what most trailguides don’t tell you: it’s a challenging hike back up the mountain to the parking lot! While it was only 1.5 miles down, it felt like 5 miles back up! The website lists this hike as “”moderate” and I think that is true if you averaged out both ways! It is certainly easy going down and difficult coming back up! Check out the video above to get an idea of the incline. This South River Falls trail was unexpectedly difficult and spectacularly disappointing in view but we still had a phenomenal time! While the destination is sometimes the draw, the process of getting there is the true reward. 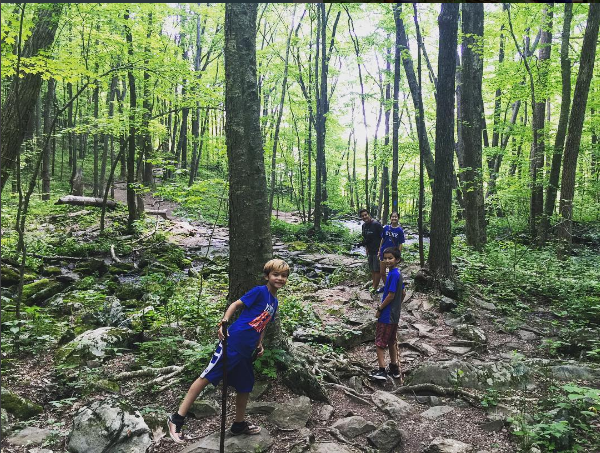 We had fun taking a couple of hours to see a lesser known part of Shenandoah National Park. It also gave us a time to talk as a family, enjoy our surroundings, and get a good workout in the process! We will definitely go back! 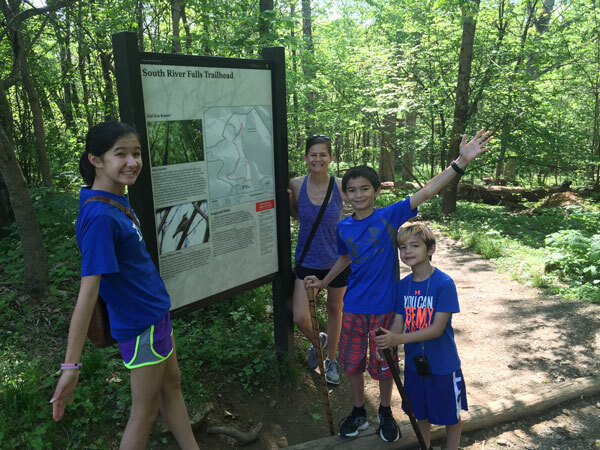 Have you hiked the South River Falls trail at Shenandoah National Park? Tell your experience below!